I think this trailer for Deep Silver's Ride To Hell: Retribution may rival The Showdown Effect for number of eye-roll inducing cliches packed into one short teaser. But where that was playing on the cartoony action of 80s blockbusters, this is an entirely more gritty affair with a (heavily Tarantino inspired) grindhouse feel. It's an odd one. Last seen back in 2008, Ride To Hell appeared to be an open world game about biker gangs - a sort of Sons of Anarchy: The Game. Now its resurfaced five years later as a B-movie brawler. "Ride to Hell is the hard-hitting over-the-top action game of 2013 that doesn't hold back. Players take on the role of Jake Conway, a man hell-bent on bringing down a ruthless biker gang called The Devil's Hand. 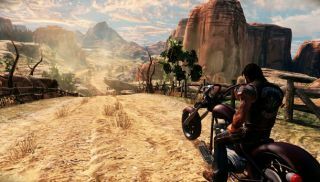 Jake will use any means necessary to enact his revenge, weaponizing his environment, getting up close and dirty with brutal melee combat, and engaging in high-speed shootouts on his custom hog." Of course, because it's Deep Silver, "over-the-top" appears to mean upside-down gun-toting stippers getting knifed. SIGH. Ride To Hell is due out in June.